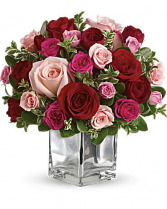 Think pink, then think of all the thank-you kisses you'll get when you send this ravishingly romantic bouquet. Lush pink and red roses, pink alstroemeria and pink carnations in a chic Red cube. Get ready to pucker up. 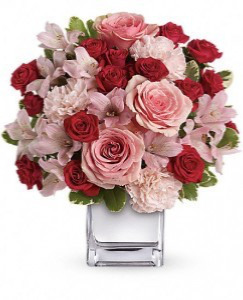 This impressive bouquet includes pink roses, red spray roses, pink alstroemeria and pink carnations accented with assorted greenery. 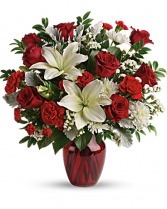 Delivered in a Red Cube and we add babies breath a Valentine’s Heart pick!